So, when I first joined here I was going to make my own pet site, 4 years later, I've kinda lost my direction and any solid thoughts on what I was planning to do have disappeared so I've decided to start again! I won't be using these images so anyone is free to take them, just don't claim them as your own, ok? You can credit me in the 'artist' or 'pet discovered by' or whatever section your pet site uses and that will be fine. I've even got the Paint tool sai files if you want to edit them and make your own colours and such! These images are have been compressed into a zip format, since attachments are limited to 10 (per post, I assume). File size is 46.2MB when compressed. 144 PET IMAGES- 1 Anni pet (egg, child, adult forms), 17 Blee (stagnant non-growing pets), 10 Drakonids (both child and adult stage), Felus (6 adult+baby forms and 10 'potion' colours (stagnant)), Fluffbugs (1 egg, 6 colours, two forms (child and adult), Glass (5 stagnant pets), Meiko (1 egg, 8 colours), Puffbird (1 egg, 4 colours), Tuftule (12 stagnant pets), Fox (28 stagnant). -19 'dye' potions for colouring pets, 3 (levelling) candies, 2 gender change items. Be sure to credit me and let me know if you use my stuff, I'll come check out your site and possibly help if you need more art stuff in the future and I have some spare time. Anyway, have a good one :3c Hope you like them. Let me know if any of you art interested in seeing some of my new stuff when I get back to making new content again, these may or may not be available for others to use though. Very generous of you to share so much with the community! Wow, nice to see some more art resources! 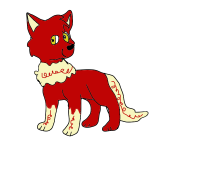 I used the NPCs and the potion on my site, Sugar Foxes. Awesome stuff Cre! I love the dragonids. Thanks for sharing with the community.